In light of the interview on last night’s Channel 4 News with the British Horseracing Authority’s (BHA) Chief Executive Paul Bittar, in which he was specifically asked to comment on the veterinary product Sungate, the BHA has released the following statement and update. Sungate is a product developed by an Italian company, produced and licensed for equine use in Italy. Its use in the UK is legal, but only when imported under the Special Import Certificate scheme administered by the Veterinary Medicines Directorate. 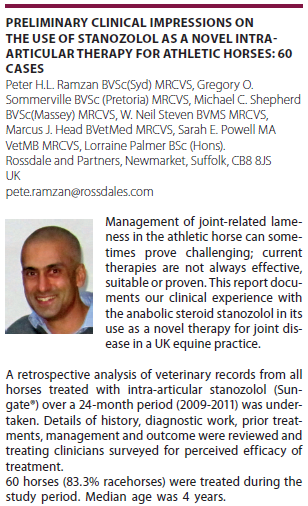 The product is intended to assist in the treatment and management of joint disease in horses. Sungate contains stanozolol, an anabolic steroid and consequently a prohibited substance under the Rules of Racing. The BHA became aware of the use of the product on horses in training following a visit to Gerard Butler’s yard in February 2013 as part of its testing in training sampling programme. Subsequently it became apparent that a veterinary practice, which had legally imported Sungate into the UK, had recommended its initial administration to horses in the care of Gerard Butler. The BHA has met with representatives of the veterinary practice in question. As a result of that meeting the BHA believes that Gerard Butler was not the only trainer to whom the administration of Sungate was recommended. Veterinary surgeons are not bound by the Rules of Racing, but are subject to their own rules of professional conduct. Therefore in order to establish the extent of the use of the product, BHA Investigating Officers will be interviewing trainers who are known to use the same veterinary practice. Under the Rules of Racing, licensed trainers are strictly liable for the administration of any prohibited substances administered to horses under their care and control. Thankfully the idea of an amnesty which was mooted by the Racing Post due the scandal has been put to bed. Good luck finding that shaded area. The BHA will conduct the testing of the horses with the analytical work being carried out by HFL Sport Science. Godolphin have stated they will cooperate fully with this process. In addition, we will also provide advice to Godolphin of necessary changes to its procedures and controls where appropriate, and this will be supported by Godolphin’s own review. Wow, a MAZ Files sequel directed by Godolphin seemingly out soon too judged by that quote. Bonus! Wonder if it’s as good as the Disciplinary Panel’s movie where it picks out all the bloopers. Another titbit on offer too, possibly a star studded supporting cast? Two more Godolphin employees have also been named by Zarooni as parties to the doping, according to Crisford. The steroids, meanwhile, and in considerable quantity, had been imported from Dubai, which is of itself illegal. “I didn’t tell him not to do it,” Crisford said, “because I didn’t think for one minute that he would be doing it. The full details of this will be formally addressed in the Disciplinary Panel’s findings, to be published in due course and once they are available. It’s late, I’m tired, I’m tweeting about doping…again, I’m bleeding followers, I need Lasix. Lasix in UK is banned substance, in the US it is not. In one country I’ve broken the rules, in another I’m playing within them. If I had used Lasix in the US, and raced in the UK later date no bother. If I had used Lasix in the UK…big bother. So what has this got to do with Sheikh Mohammed…everything. Al Zarooni said: “I deeply regret what has happened. I have made a catastrophic error. Because the horses involved were not racing at the time, I did not realise that what I was doing was in breach of the rules of racing. Again, we go back to the terminology used by MAZ in his statement: “Because the horses involved were not racing at the time, I did not realise that what I was doing was in breach of the rules of racing. In short, if Mahmood Al Zarooni had carried out his doping programme in Dubai, shipped them back into the UK, he would not have been in breach of any rules, Joe Public would be none the wiser and Sheikh Mohammed would not need to bring ethics to the table. So, maybe before Sheikh Mohammed starts slagging off one of his appointed trainers, he should get his own house, well Emirates Racing Authority, in order first and then his appointed trainers would know where they stand. That’s a line from Mahmoud al-Zarooni’s statement on Goldolphin.com today following the news that 11 horses in his care have tested positive for anabolic steriods. His big break came in 2008/2009 “when H.H. Sheikh Mohammed took him to assist Mubarak bin Shafya at Al Asifa Stables. He sampled a taste of major triumph when Mubarak bin Shafya saddled a remarkable double at the 2009 Dubai World Cup meeting gaining success with the front-running Gladiatorus in the Group One US$5-million Dubai Duty Free and then with Eastern Anthem who secured a pulsating last-gasp triumph in the Group One US$5-million Dubai Sheema Classic. Following those victories, H.H. Sheikh Mohammed asked Mahmood Al Zarooni to join the Godolphin team as one of Saeed bin Suroor’s assistants. He gained valuable knowledge during his first season in Newmarket when the stable posted 148 winners in Britain, enjoyed Classic success thanks to Mastery’s Ladbrokes St Leger victory and captured a Breeders’ Cup race with Vale Of York. As far as I am aware, this is the first winter where horses that have not raced at the Dubai Carnival stayed in Newmarket as per an email confirmation I received from Godolphin. Mahmood Al-Zarooni bleeds Godolphin, so for him to utter the line “because the horses involved were not racing at the time, I did not realise that what I was doing was in breach of the rules of racing.” leaves you wondering how the Godolphin operation works as a whole. I don’t think I need to list other big race winners for the boys in blue, I think you get the picture. “Wintered well in Dubai.” How many times have we heard that line? 503,000 results as per Google. Hello Dan,I am unaware as to whether Adam intends to respond or not. However, I would point out that your letter is over 1,200 words long and divided into ten incredibly detailed questions about a case of nearly four years ago and related to findings published two years ago. It also includes several sarcastic comments along the lines of “Ouch – That’s got to hurt?” If I was a member of public writing to a senior Director of an organisation I would probably not expect a response to such a letter. That is just my view though. Due to the actions of a BHA Committee Member, were the BHA complicit in the administeration of illegal race day substances during the period of 2003-2009? In turn evidence at a Disciplinary Hearing was suppressed to ensure the scale of systematic doping within the sport was never known until RCVS findings were published two years later in the hope that questions such as the ones in my original letter were never asked?